I built some new Alpha RX-1 irons and decided to see what Iomic grips are all about to see why they are so costly and if the performance is the worth the cost. IMO definitely just another grip. Am I wrong? What are others experience? I used the Iomic Sticky 2.3 navy grip. I would compare them to the PURE Pro a medium firm grip with some grip-tion but personally prefer the PURE Pro or Star Sidewinder to the Iomic and then add in price and it's almost ridiculous. I thought, I was missing something so thought I would post this for others. I use black ones on my drivers only. They are great in the rain and that's the one club I lose if the grips are slippery. I had them on a set of irons and did not like them. Too sticky in the heat. and yes, they do return to tacky feel if you wash them with dish soap and water. and maybe too tacky for some. 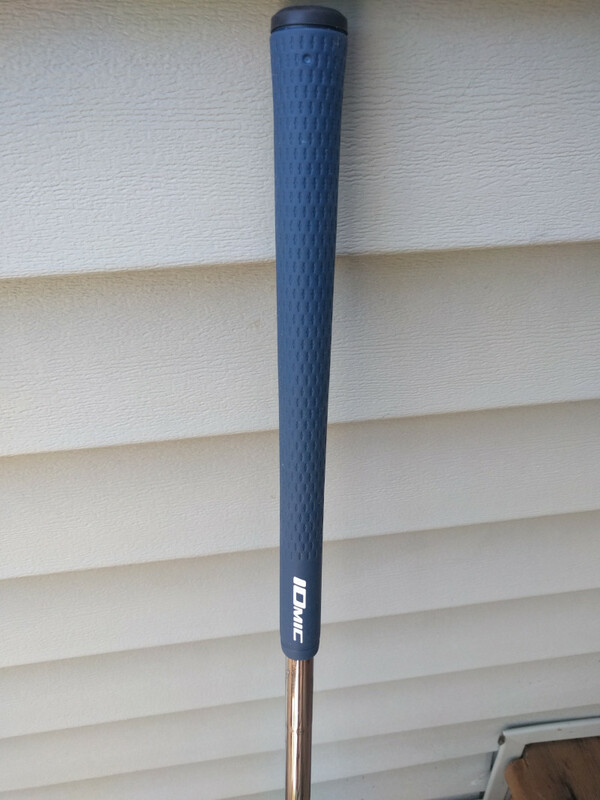 The Lamkin iline was made by iomic for Lamkin.....tried a few of them in OS, overall I liked them, they had some nice tack, but were not durable.....and even the iline was fairly expensive. Not sure if the exact.same.compound was used in the iomic as was the iline. I would agree that pure pro or star.sidewinder were as good or better and a lot friendlier on the wallet. Haven't heard anything about them in years. I remember some people saying they were tackier than anything else, and if they didn't feel that way wiping them with a wet towel would restore full stickiness. Even some of those who liked them a lot agreed they were overpriced. They seemed to feel too firm for me. They appear to be as gayazz blue as the rest of the blue grips available. I tried one on a driver. I was not impressed or unimpressed. It was not as tacky as a Pure DTX which is my go to grip now. Too many other good choices out there to be bothered. I have a wedge with one on it but it's not like I'm saving strokes using Iomic grips. The color selection I think might be what makes people spend for them. If you shop on Wish or Geek you can find them for much less although you have to watch that they don't gouge you for shipping. I think they are nice, but not that special. I liked their putter grips better which could be had on ebay for a reasonable price.